ROCK focuses on historic city centres as extraordinary laboratories to demonstrate how cultural heritage can be a unique and powerful engine of regeneration, sustainable development and economic growth for the whole city. 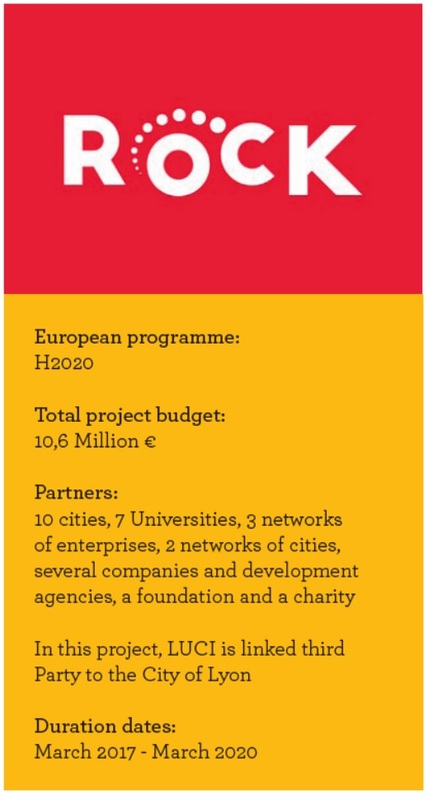 The project involves seven Role Model Cities (Athens,Cluj-Napoca, Eindhoven, Liverpool, Lyon, Turin, Vilnius) and three Replicator Cities (Bologna, Lisbon, Skopje), which are engaged in using cultural heritage as driver for urban growth, sustainability commitment and social inclusion in their political agenda. ROCK will produce outputs related to three main domains of innovation: organisational innovation, technological innovation and social innovation. Among other activities, LUCI is involved in the ROCK project to explore how cities can create better urban lighting governance structures that limit light cacophony and ensure quality lighting. The accessibility of LED technology and its multiple potentials for colours and dynamism has led to its widespread use. With more and more media facades and projections in the public realm, private owners are increasingly using light to enhance their visibility in the urban space. This might in some cases create lighting conflicts – a form of light cacophony – particularly in places where the nocturnal landscape has been carefully crafted, such as, for example, in city cultural heritage areas. In many cities there is no overall governance framework to regulate, coordinate and prevent this invasive use of light. LUCI is currently supporting a field study by the City of Lyon and INSA (the National Institute of Applied Sciences – Lyon) that aims to develop a typology of private lighting initiatives and analyse their impact on nocturnal ambience in three sectors of the historical city centre. LUCI will also conduct a benchmark of existing regulations and practices at the European level. The results of this study will outline some of the major challenges faced by cities on this topic and will be accompanied by case studies and potential good practices. A seminar to present the results of the study and initiate further discussion among cities is planned in Autumn 2018.